It’s kale and new potato time at the New Albany Farmer’s Market, stop by and pick some up and you too can make this delicious soup. 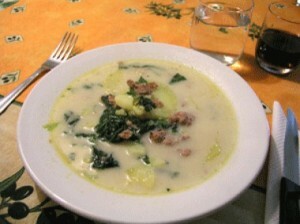 The following recipe is one I found from a website called CopyKat.com., it’s the olive garden potato/sausage/kale soup. I made this at home and was really impressed!! This is definitely something I will make again and again. Below is the recipe as I found it, and I have also included my variation of the same soup. Preheat oven to 300 degrees. Place sausage links onto a sheet pan and bake for 25 minutes, or until done; cut in half length-wise, then cut at an angle into 1/2 inch slices. Place onions and bacon in a large saucepan and cook over medium heat until onions are almost clear. Remove bacon and crumble. Add garlic to the onions and cook an additional 1-minute. Add chicken base, water, and potatoes, simmer 15 minutes. Add crumbled bacon, sausage, kale and cream. Simmer 4 minutes and serve. Optional: add half teaspoon of fennel seed.